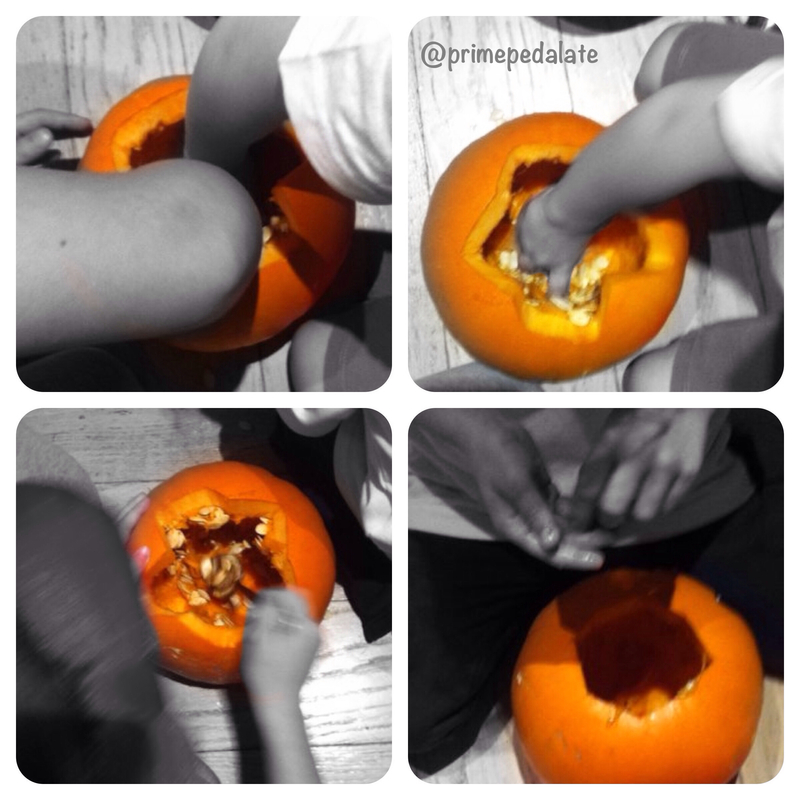 I know this post of mine has absolutely nothing to do with the cycling world, but, before being a cycling lover, I am completely in love with my children and I spent yesterday afternoon carving some pumpkins with and for them. Now, waiting for my next cycling ride (it the weather lets me…), here are the instructions! PS: All the pictures of this post hsve been taken yesterday by my eldest daughter, who is six years old. Without her support I coudn’t have published this post. I love you, my sweetheart! 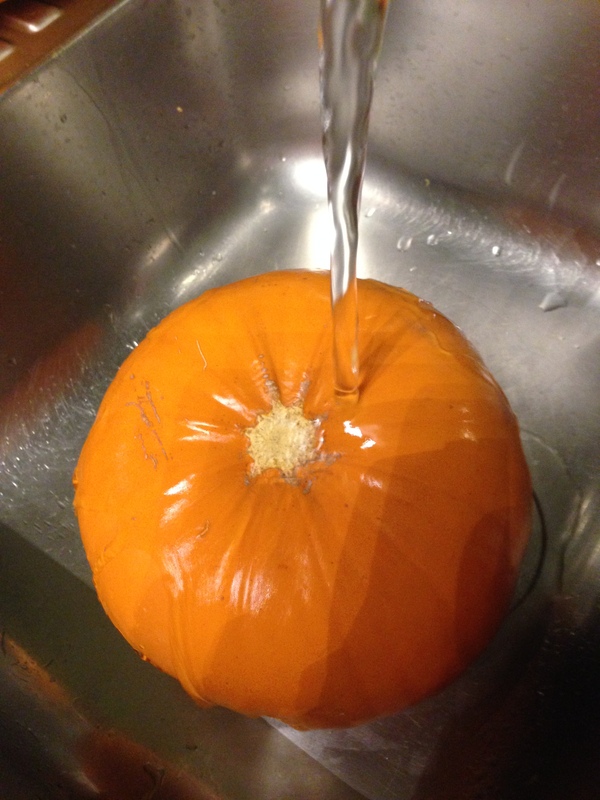 Wash the pumpkin in warm water. I added some baking soda to get rid of any possibile bacteria. 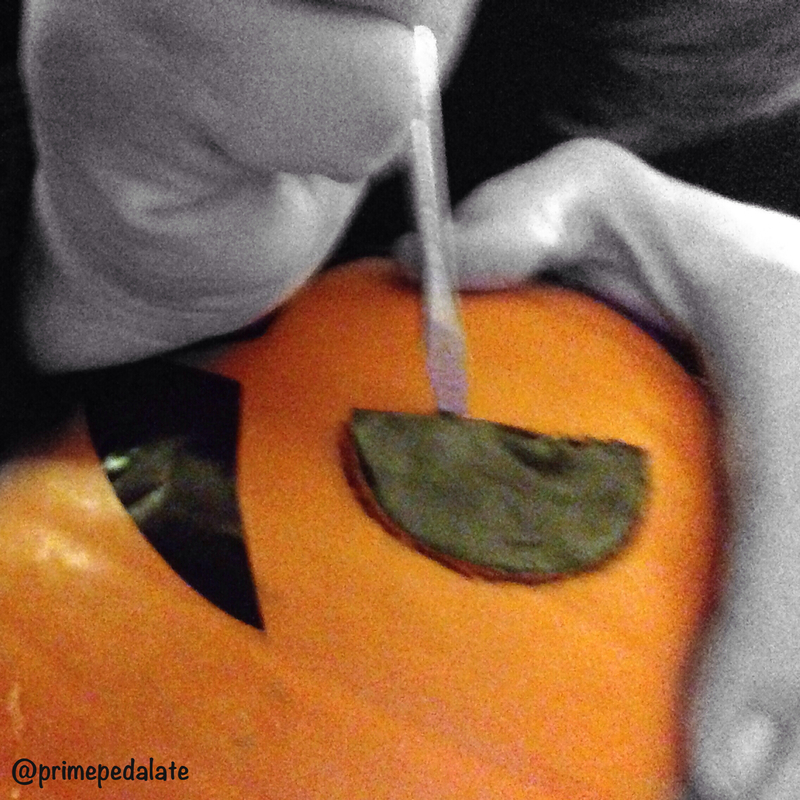 Draw a kind of a circle around the stalk with a washable marker. 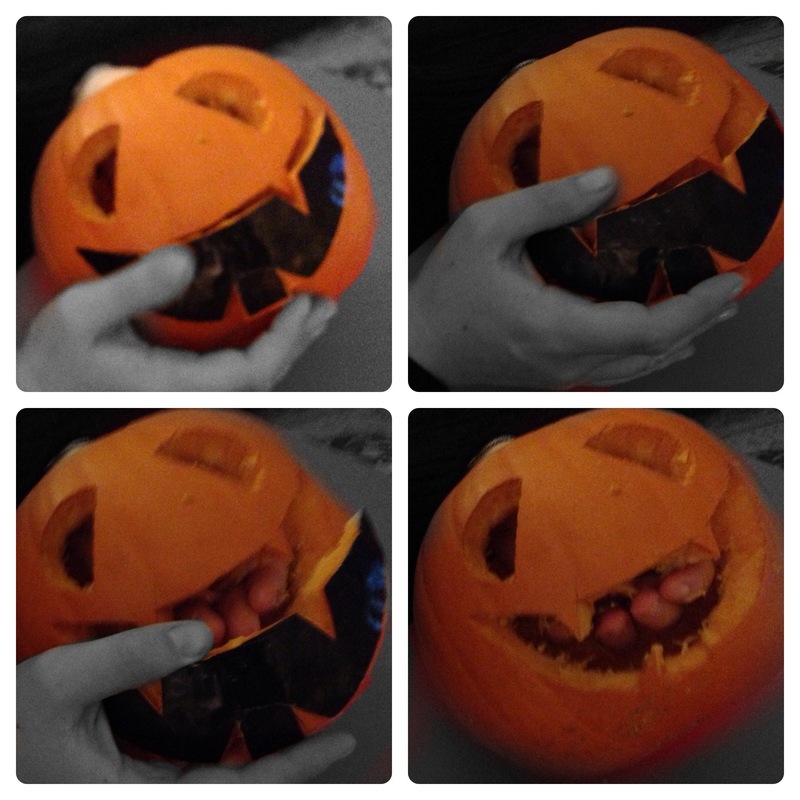 Take a sharp knife and cut the hole. Now remove the top. 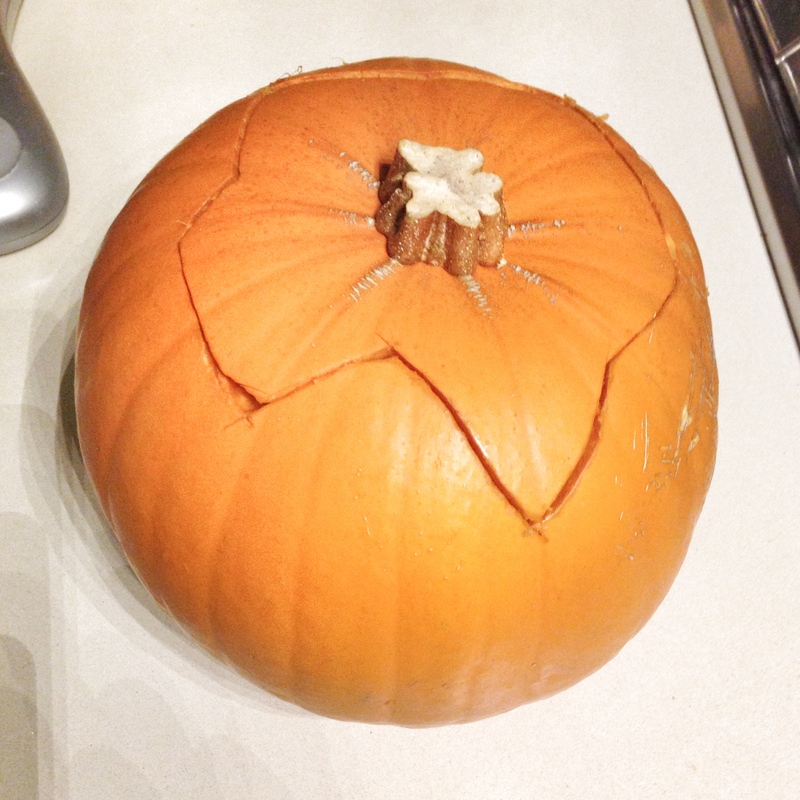 Remember to tilt the point of the knife into the centre of the pumpkin. This way, it will prevent the lid from falling in. Scoop out flesh, pulp, and seeds with your hands at first, and then with a spoon or an ice cream scoop, which works perfectly for this. 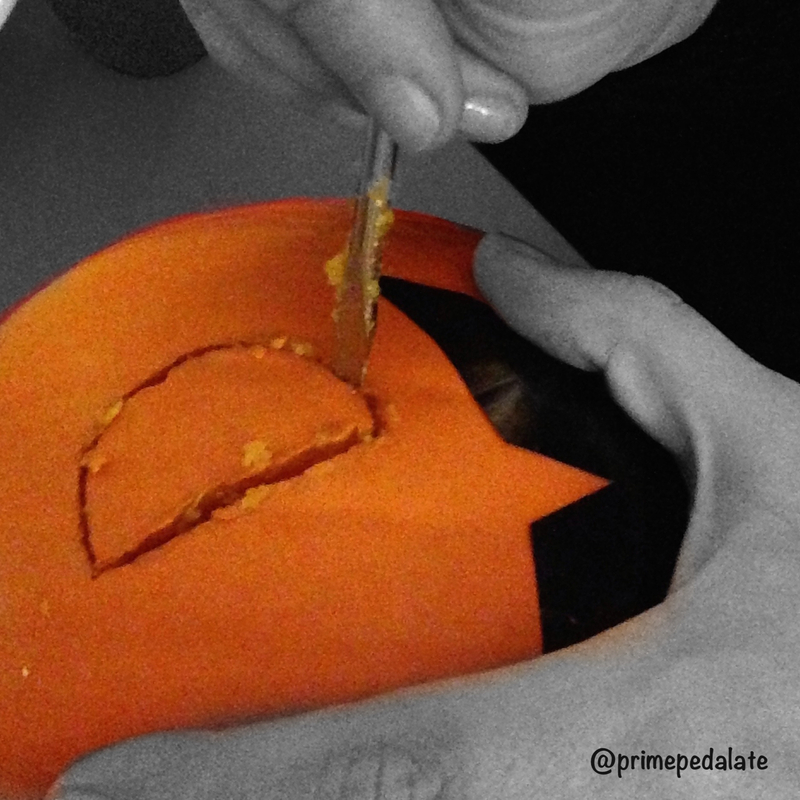 If you don’t feel like putting your hands into the pumpkin, use a pair of disposable gloves. You are now ready to carve! 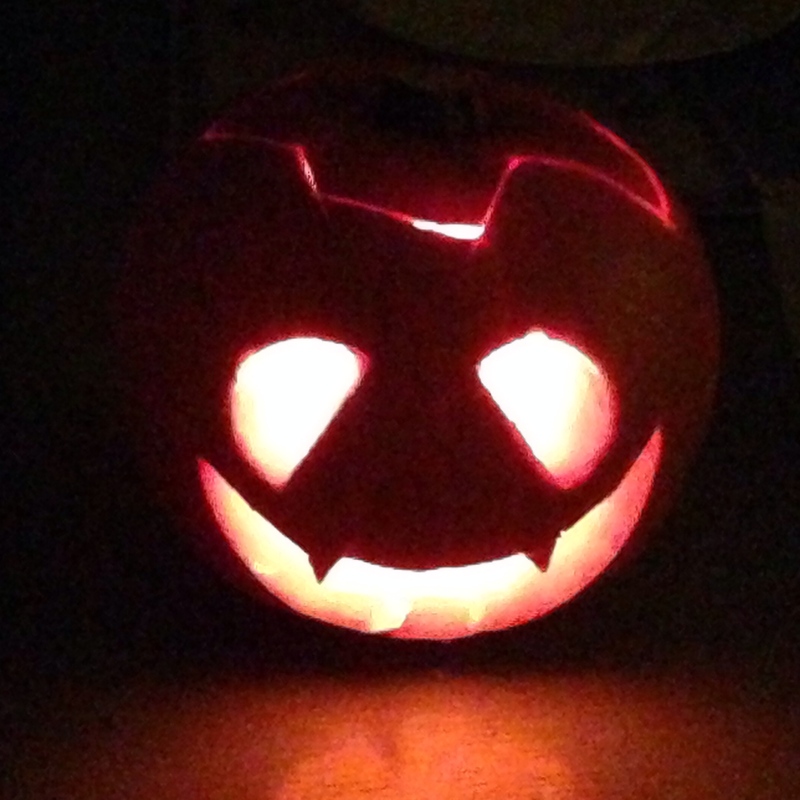 The pumpkins I bought had already “pumpkin face” stickers on them, so it was easy to choose the design.. If you are using a stencil, transfer your paper stencil onto the pumpkin and trace the design by poking holes with a skewer or a sharp tool. When you are done, remove the paper stencil and you will have a clearly marked outline of where you have to carve the face. 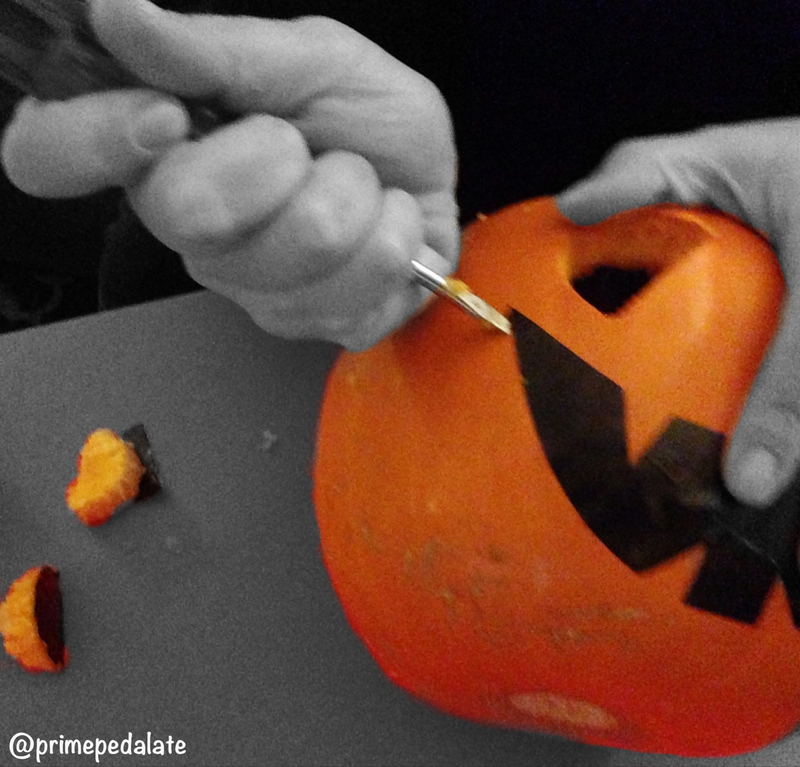 You can now carve your pumpkin with a short sharp knife. 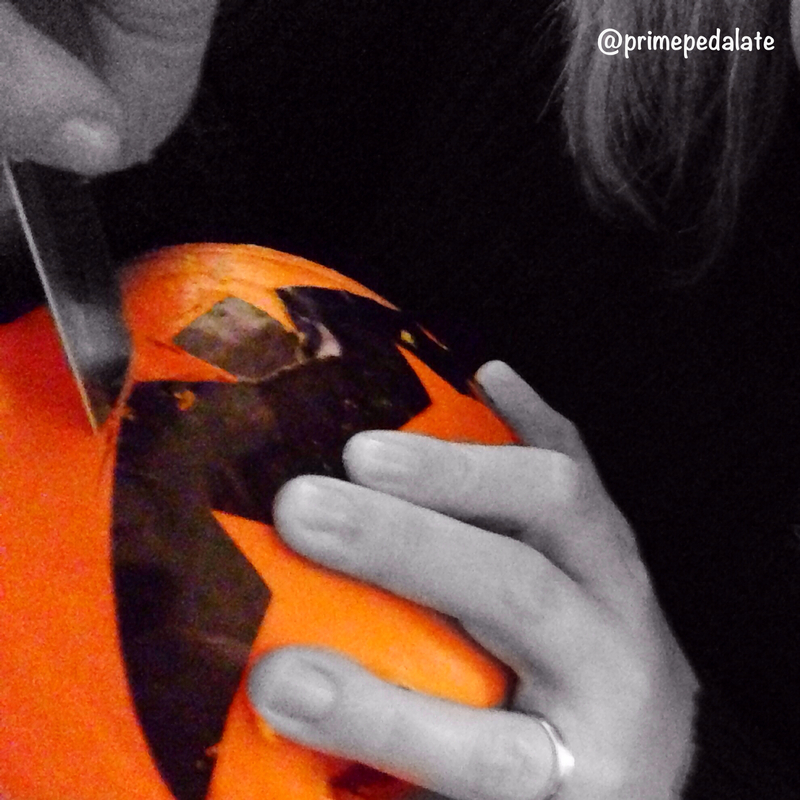 Grasp the knife like a pencil and hold it at a right angle to the pumpkin. Move it steadily up and down, working from dot to dot. 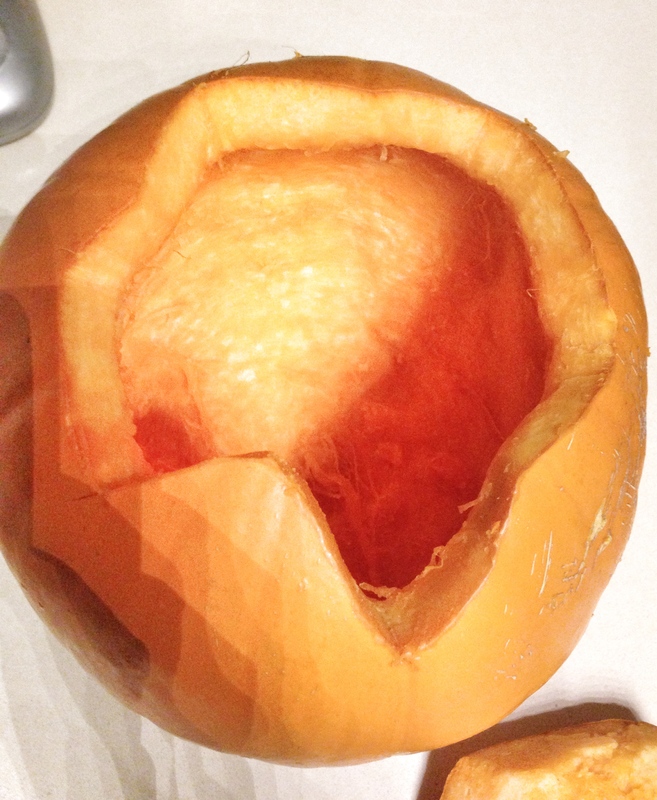 When you are done, simply knock out the carved pieces and now trim up the edges, angles, corners and inside of the pumpkin with a knife. While my friend Monica is finding any possible excuse in the world to postpone our next cycling ride, I thought, in the meantime, to take the opportunity to share with you something different, but always linked to the cycling world. I really like when I get the chance to be creative with my two little girls. 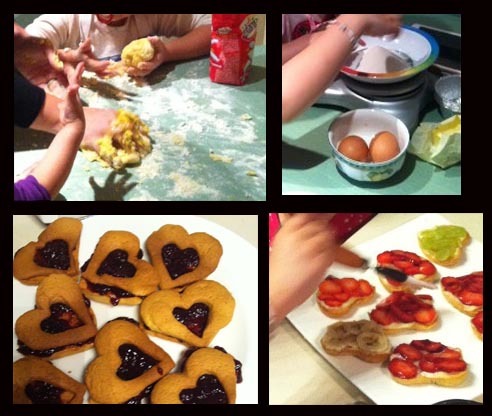 I love arts and crafts and baking cakes and cookies with them. I love to see the joy and enthusiasm in their eyes ! 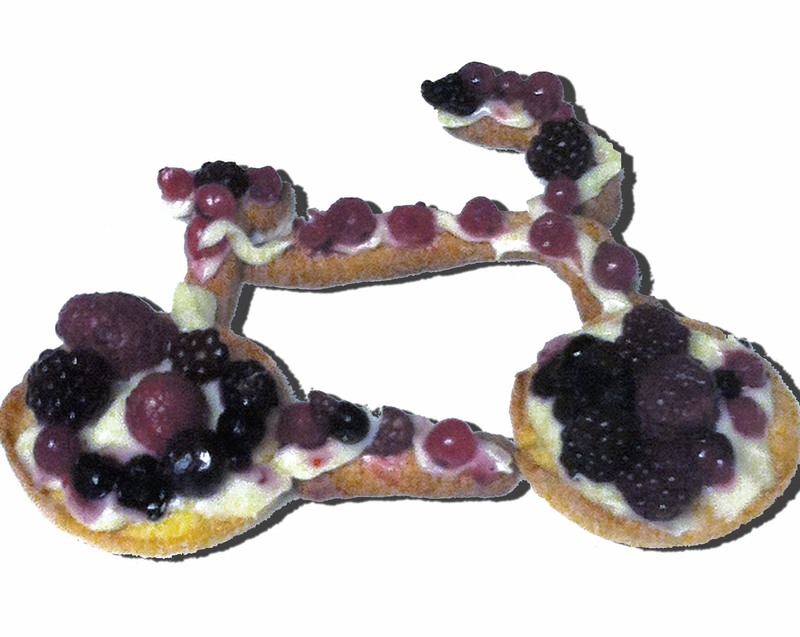 Here come a recipe for something delicious for my husband, who is a big big fan of cycling! We used the Thermomix , so I’ll put both the recipes – with the Thermomix and with the traditional method – Before you begin, though, let me remind you, if you are going to use frozen berries, to remove them from the freezer and put them to drain. 1) place strips of lemon zest in the Thermomix bowl. Process for 20 seconds , speed 9. Empty the bow and place the mixture onto a table and roll it. I usually divide the dough in two parts so that both my daughters can have fun at the same time. Then wrap the doughin cling film and rest in the refrigerator for about one hour. Place all ingredients on a counter and knead well until the dough has a smooth texture and gets firm. Wrap in a cling film and let it rest in the refrigerator for at least one hour. 2) Take the dough from the fridge and I put on a lightly floured surface. Divide the dough into small pieces and flatten them with your hands, to around half a centimeter thick. 3) Use your cookie cutters. 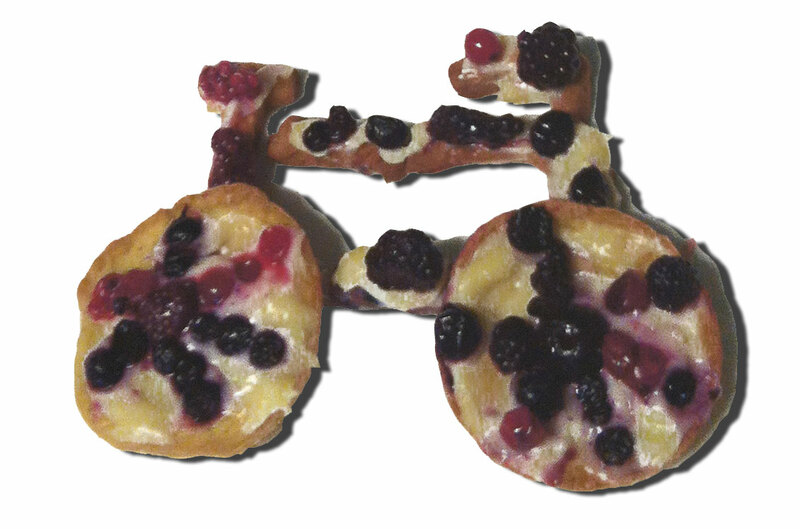 ( for the wheels of the bike, we used a circle cookie cutter, for the other parts of the bike, we used an umbrella-shaped cookie cutter; we used only the part of the handle and with then used our hands to find make other shapes according to our needs). In a medium saucepan heat the milk to just below boiling point. Slowly pour over the hot milk and stir well, cconstantly, with a wooden spoon. Cook until the custard thickens. When the cream is ready, pour into a bowl and cover with grin film, let it cool down to room temperature. When both the cookies and the custard cream cooled down enough, you can start decorating them!Top the cookies with the custard cream and then with the berries. The other night in bed I read ” Bicycle” magazine , and this sounds unbelieveble for two main reasons: the first one is because it is usually impossible for me to be able to find the time to read at night as, in general, while I’m trying to make my daughters sleep, I fall asleep before them. And then because I have so many books next to my bed waiting to be read. But that night I chose and I repeat , I CHOSE to read a bike magazine . Every three words , however, I found myself asking my husband, who was reading a history book, that I wouldn’t read even if I was obliged under torture, to explain the meaning of what I was reading. But this time it’s different. Since we aren’t dealing with family matters , but with his first and true (and probably only) love, and by that I mean, of course, the cycling world, I notice that he is listening to me and I keep on asking him many questions. And he gives me very accurate and, apparently, very clear answers. I pretend to understand nodding. I do not know whether he believes be or not, but this allows him to go ahead reading , which is great. But since that night I decided that I would study. And I have . Oh … yes I have ! 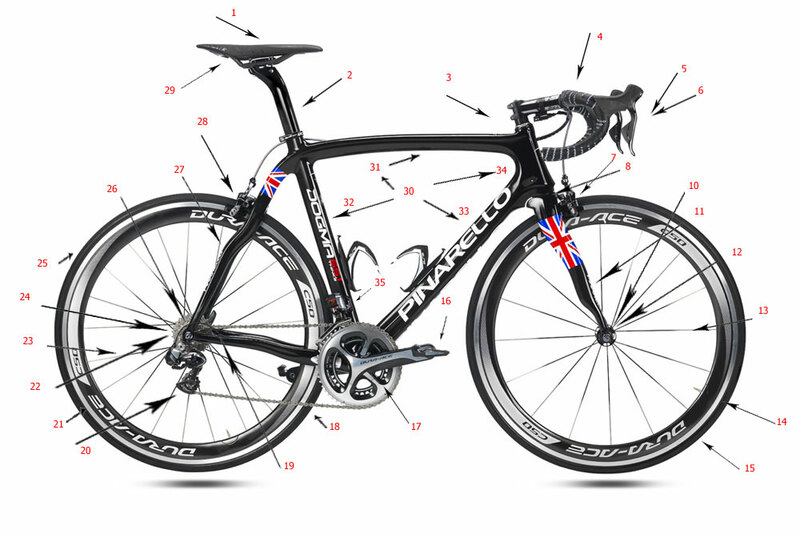 I looked at a dozen of Italian and foreign websites and then, with my own hands, I created this image using a new Pinarello bike , that would be my dream, but it would be super surely too professional for me.And here’s the result. I hope it will be useful for those who, like me, have only recently started bike riding and the ones who have fallen in love with it. I feel like when I took the General Linguistics . I studied a lot. I got a good grade. I walked out of the classroom exam and I had already forgotten everything . Basically, it really is a mission impossible to me! Hope you’ll have a better result! You can have a try! Good luck! I did not know , frankly, that I would have made it , but in the end , I hoped so ! When I was a child, I used to come this way to go the mountains and I hated it because of the uncountable curves … and I always felt sick. Imagine on a bike! I left Brescia , as usual and took the Triumplina road . Nightmare. I would have like to go back home immediately . Traffic, non-existent or impractical cycling path. Then we turn right towards Nave. I am already tired. Here the traffic begins to decrease and it goes more secure (in the sense : with less fear of having an accident ) . And just after Caino , the climb begins. It was the first time I did it and I must say that I stopped at least 3 times during the climb. The official excuse was that I was thirsty and I had to stop and drink slowly , the real one is that I felt like dying ! In fact, now that four months have passed since the first time , looking back , it seems almost impossible that I found the climb so hard , because it’s a soft, pleasant, uphill. However, when , FINALLY , I got to the top, I was super happy! After the photo that immortalized my climb to the top, we went down from Vallio Terme. For this descent , which is beautiful , it would be advisable to have a jacket . I had , but I hadn’t fully zipped it, which produced a parachute effect …not the best thing to be done. The road is very steep . after nearly 6 months of bike and more than 1500 km, I have not yet learned to hold the handlebars from the bottom, and now I sincerely cataloged this thing in my personal folder of the missions impossible ( in which we find also: understand a spy movie , let the plants on my terrace to survive … ) . Pedaling down towards Vallio Terme not knowing how to brake from the bottom of the handlebar, means horrible fingers cramps! Then we arrived in Gavardo , you resume the path and back to Brescia. After the effort of the climb , a bit of flat cycling path can only warm the heart ! 🙂 Very nice ride !